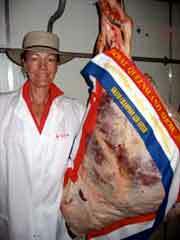 Prize-winning beef cuts from Jeannette and Peter Stebbin's Ardrossan Stud, Victoria. that should be in Keith Smith's data base? If you do, please pass it on URGENTLY. It will help us in the future development of the breed. have performed very well in carcase competitions. In an effort to gather as much accurate and credible information as possible, ALCA has appointed me to collect and record verifiable carcass information." "We need carcass data from both Lowline and Lowline cross animals. Lowline sire or dam and the other breed should be named. The information needs to be verifiable so please let me know its source. 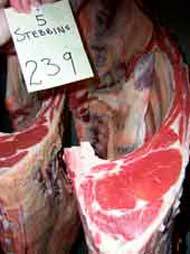 If you have results from past Hoof and Hook competitions, please send them. the most important tool in future Australian Lowline marketing and advertising campaigns. It may also assist in identifying better performing animals and genetic lines from within the Australian Lowline herd. So please do everything you can to get all appropriate information to Keith. at PO Box 949, Goulburn NSW 2580.